A geosocial footprint is the combined bits of location information that a user divulges through social media, which ultimately forms the users location "footprint". For Twitter.com users, this footprint is created from GPS enabled tweets, social check-ins, natural language location searching (geocoding), and profile harvesting. 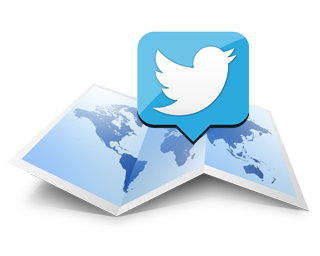 This website provides twitter users with an opportunity to view their geosocial footprint. In addition, it informs users of some potential areas of concern with their current sharing habits. To begin, enter your Twitter.com username in the input box below and press "Retrieve Tweets". If you want to hear more about why we're making this website, check out one of these recent articles about us: USC.edu, Wired, Vice, Daily Mail, Google Maps Mania. This website is an educational demonstration of how public Twitter.com data can be harvested and analyzed to uncover location intelligence. With 14 million tweets per day containing embedded GPS coordinates, and up to 35% of all tweets containing additional location information, viewing trends and making predictions is not only possible, but it should also be a considerable privacy concern for social media users. GeoSocial Footprint: A geosocial footprint is the combined bits of location information that a user divulges through social media, which ultimately forms the users location "footprint". For Twitter.com users, this footprint is created from GPS enabled tweets, social check-ins, natural language location searching (geocoding), and profile harvesting. Mr. Weidemann has a deep love for technology and more so a passion for solving problems with technology. He is currently using geospatial and web technologies to solve problems for federal clients. Chris has personally managed over 50 technical geospatial projects including web based mapping applications, desktop based data management and analysis platforms, mobile field collection suites, and much more. He is also responsible for gathering business requirements, system design, product ownership, development, testing, implementation, staffing allocation, budgeting, and direct client interaction. This web site was developed as part USC's Spatial Sciences Institure graduate program. Aug 25, 2013 - Subdomains finally work. Basics of CouchDB is up. Added a tweet button. Aug 23, 2013 - A few bug fixes. Users can now center and zoom the map to an area of concern item. Added a feedback survey. Aug 22, 2013 - Error handling for users that have private twitter feeds and usernames that are spelled incorrectly. Aug 21, 2013 - URL parameter passing: screen_name="screenName" along with some parameters for passing function calls. Aug 20, 2013 - Moved the site to Amazon S3 and it's own domain. Can we talk you into feedback?